Back in the summer I took a trip to Andersonville National Cemetery . 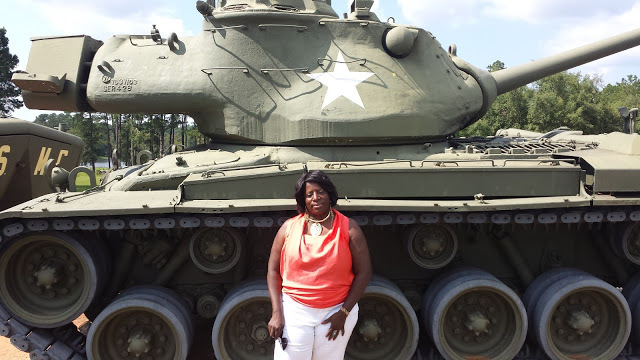 I spotted this old Army tank and could not resist a photo op in my thrifted ( big jewelry **notice the necklace) I got it a few years ago at a sale in the home of Miller Miller who is now part owner of Miller Bynum Designs and Rite At Home Interior Design . The white pants were a great deal at Kmart! My orange blouse was as good as thrifted from JC Penny !